All major credit cards accepted. Driver's license required for equipment rentals and camping. Indiana sales tax is an additional 7% or you can bring your organization's tax exempt number. TRANSPORT YOURSELF OPTION - Groups with advance reservations can access additional discounts by shuttling your own people and we haul the boats. Contact us for details. *CHILDREN CAN RIDE FREE in a canoe with 2 paying adults. Children should not ride with inexperienced paddlers. Parents are cautioned that river conditions may not always be suited for children. Parents must assume all risks associated with river activities for their children. 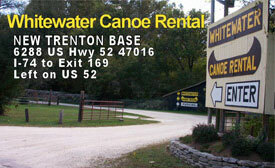 ALL PROMOTIONS HONORED - We accept all canoeing and kayaking promotions regardless of river. All promotions are taken off the regular 'D' rate. Only one discount permitted per boat. 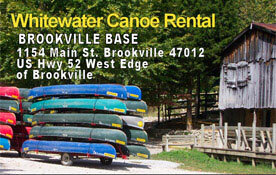 Whitewater Canoe Rental also offers trips on Brookville Lake. Ideal for youth group trips or days when river levels are too high. We reserve the right to cancel any trip due to adverse weather, unsafe water conditions or for any other reason.